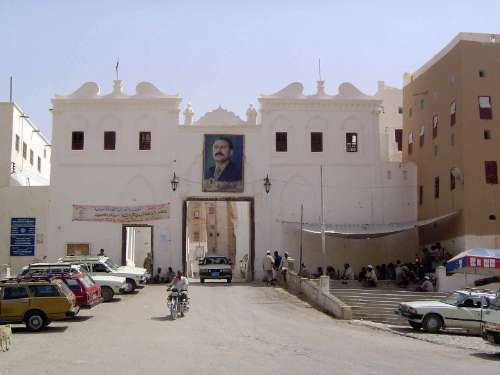 As Appassionata is not a bad name for a certain sonata in A Flat, so Manhattan of the Desert is not a bad name for Shibam, the most famous town of the Hadramaut. The city is striking enough to warrant a drive around the wall before entering the single gate. 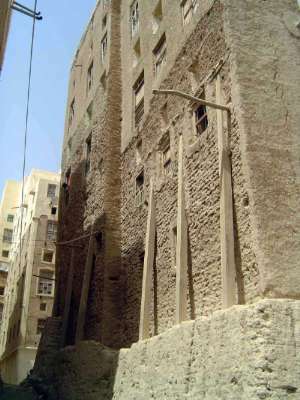 Most of the houses are no more than a century old, though this can be tricky, because old buildings are often restored and look new. The balcony is unusual but even more suggestive of New York. 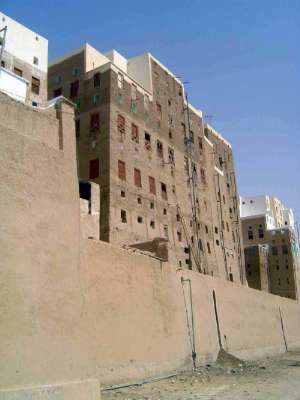 The general design of the houses, like those in Sana'a, is for a central pier around which a staircase winds and from which cross walls reach out to the exterior to form rooms and provide rigidity. 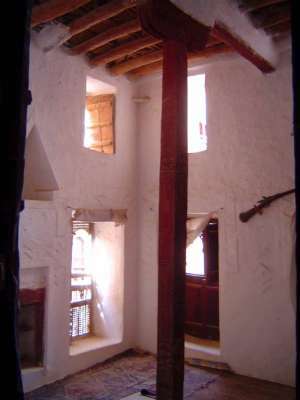 The ground floor is for storage, the second floor is the men's reception and winter-sleeping room; the third and fourth floors are for women. For summer sleeping these houses have unroofed rooms positioned so they are invisible from neighboring buildings. 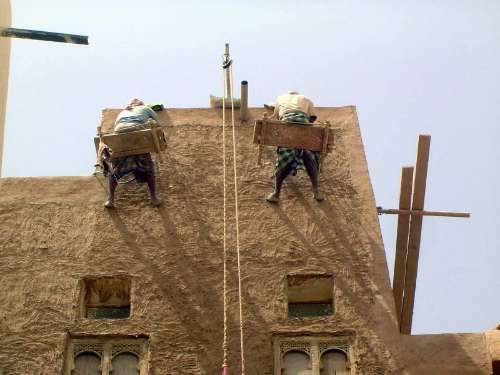 The fifth floor and above are for married children or common use. 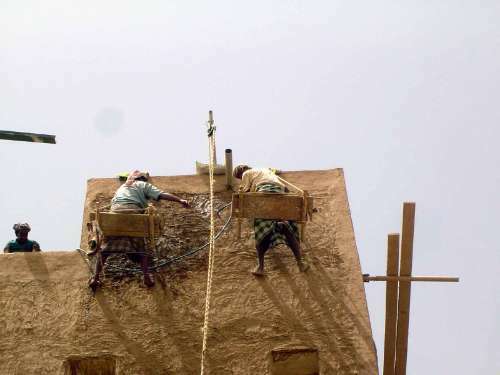 Maintenance of massive mud-brick buildings is a never-ending task, as the crack of separation suggests here. Let maintenance slide too far, and you invite disaster. The sole entrance, a confection of classical design and megalomania. Note the three entrances: there's the main one, one for women, and one that is blind. Immediately inside the gate there's another dose of classicism smack in the al-Qasr or castle square, one of five squares within the town. 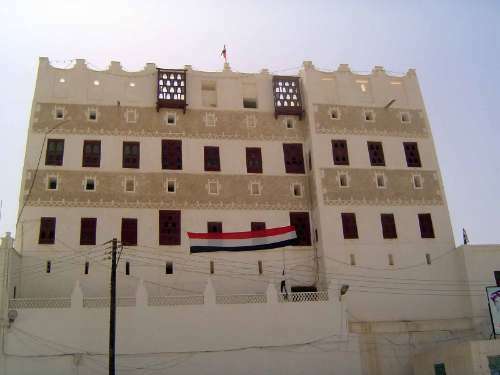 In a more indigenous style, the old governor's palace now houses the German aid organization GTZ, responsible for protecting Shibam. 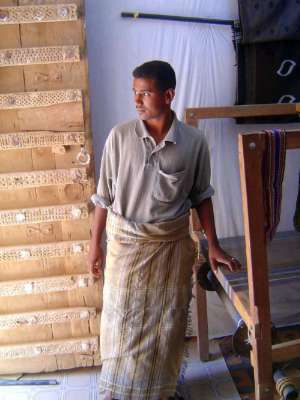 The program rests on the principle of self-help, with GTZ contributing a third of the cost of renovation. 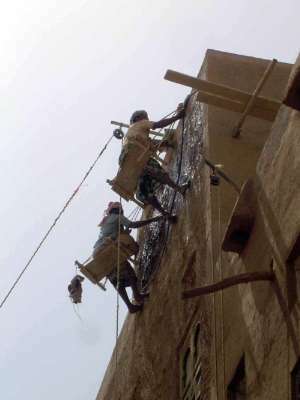 This was a 10-year program beginning in 2000; by 2007, about a quarter of the town's property owners had taken advantage of the help. The small windows, by the way, are for guns, not the view. 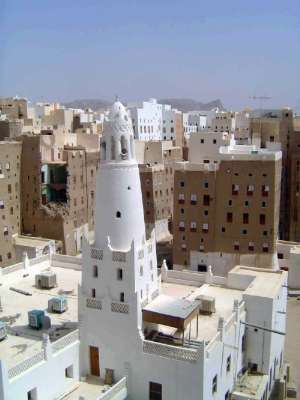 The view from the roof of the palace and over the minaret of the Masjid Maruf. 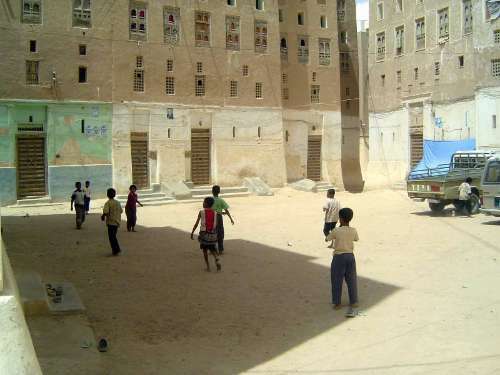 The bands of a contrasting color at the top and base of many buildings are protective mortar against the occasional rain, dangerous to mud-brick. 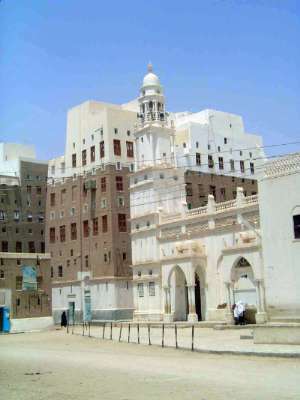 In the center of the town there's a well to serve worshippers at the Masjid Harun al-Rashid. The mosque is a rarity on two counts. 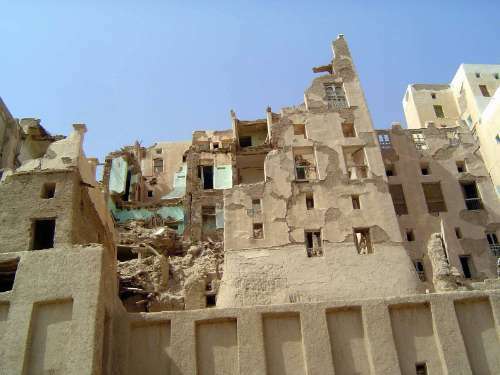 First, it's lower than the surrounding residential buildings. Second, it's also the only building in town that's built of baked brick. 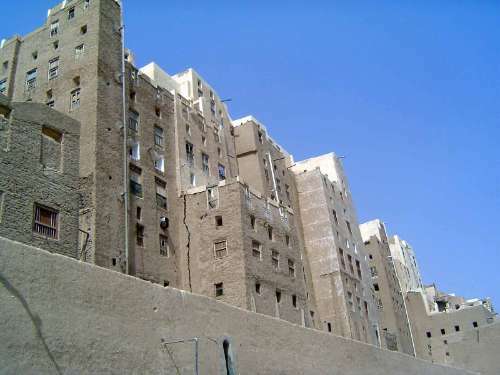 Had you noticed that the walls of the houses are battered? They're thick, too: three feet at the base, one at the top. The bricks themselves are smaller in the higher floors. 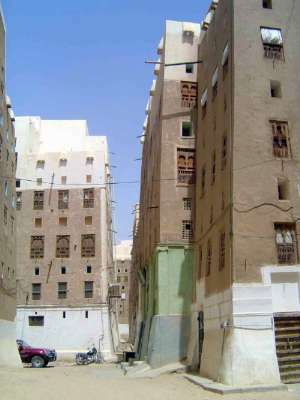 The lower floors have few or no windows--deliberately, for security--and were used for storage, especially in times of siege. 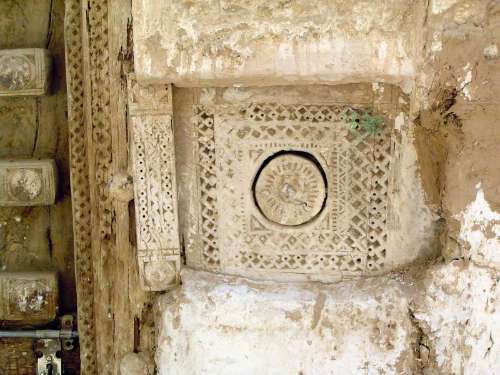 The windows are screened with planks of carved wood, not the myriad small pieces of the meshrabiya screens found elsewhere in the Middle East. 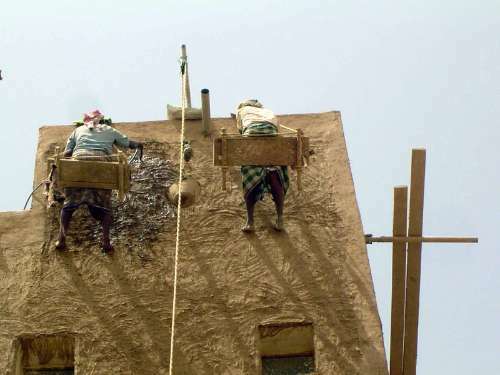 Sometimes the buildings join above ground level, partly as a defensive measure and partly to allow women to move between buildings without appearing on the street. Sometimes the buildings get emergency supports. 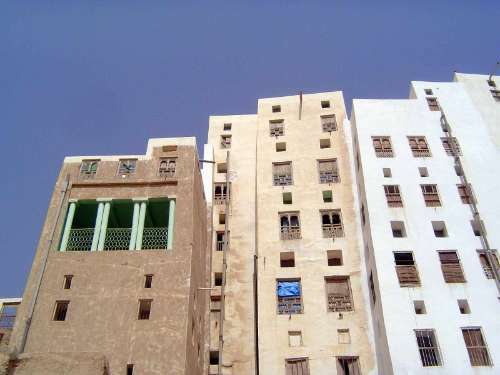 Above all, the buildings have to be periodically mudded to fill in cracks. 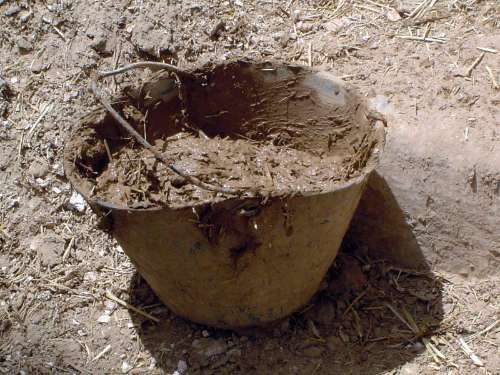 The man on the left sprinkles the surface before applying new mud. Madar waiting to go aloft. 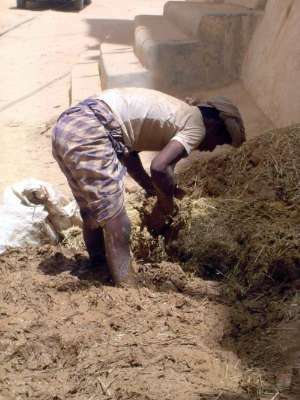 The earth comes from surrounding fields but is mixed with straw. A finely carved door handle. 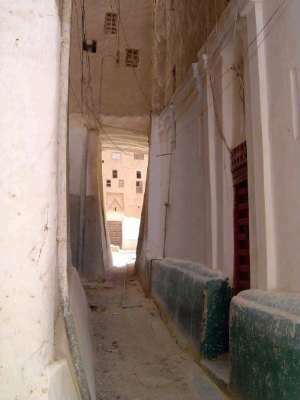 Houses have no courtyards and only a single entrance. Deep-set windows had no glass but are screened with the thorny ilb tree; windows are placed low on the wall for a better view of the street. 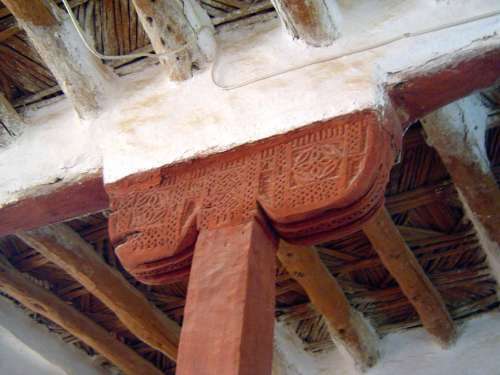 The flat ceiling or musattahah is made of branches of palm or Zizyphus spinachristi overlaid with thinner branches. During the 1980s, some owners substituted iron pipe that had been imported for water mains. 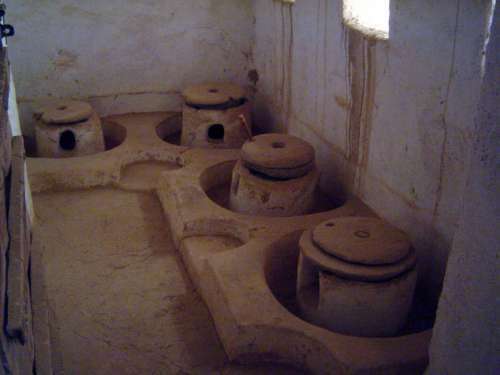 In the old days, women ground the wheat or millet here for daily bread. Barefoot in the park. What will they do in coming years? 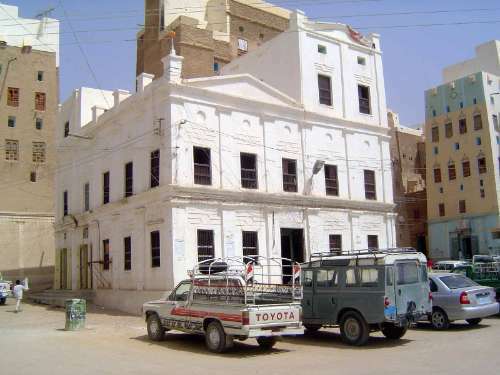 Shibam was once at the junction of trade routes, and its homes belonged to wealthy merchants trading not only across Arabia but to Ethiopia and Java. 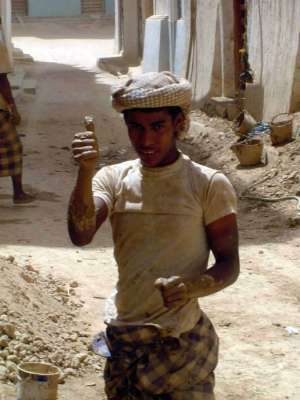 People of lower status--tradesmen, peasants, slaves--lived outside the town. Now there's tourism and....? 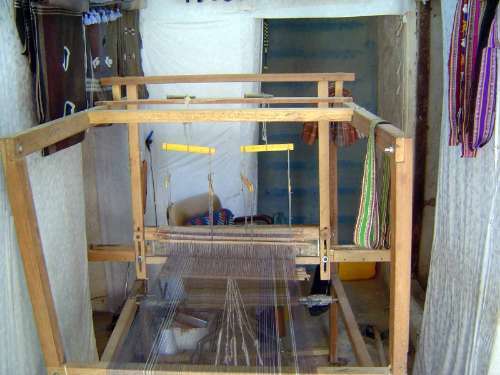 A loom, producing belts and bags for tourists. 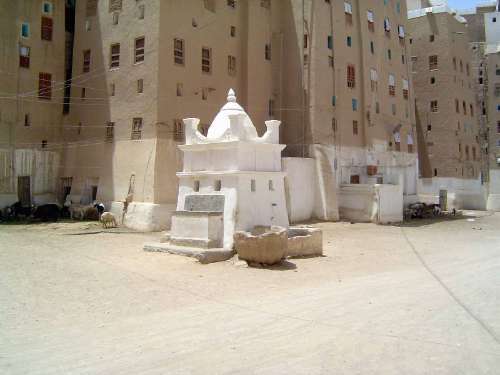 For much more about the buildings of Shibam, see Salma Samar Damluji, The Valley of Mud Brick Architecture(1992).